The combined hardware and manufacturing cost of the new Xbox One S game console from Microsoft, an analysis says, amounts to $324. That’s just $24 more than the most recent Xbox One teardown analysis conducted in March of this year by business information provider IHS Markit, primarily due to upgrades in the fabrication of its central processing unit (CPU), the inclusion of a two terabyte (2TB) hard drive and an ultra-high-definition (UHD) BD-ROM player in place of the previous conventional Blu-ray drive. 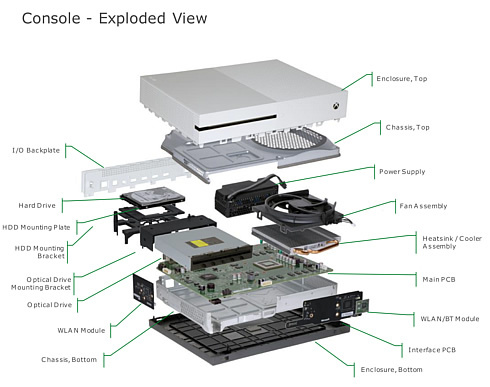 "The new Xbox One S represents a natural evolution in the product line, incorporating technical advancements that have become available since the previous design," said Kevin Keller, the senior principal analyst for IHS Markit who spearheaded the teardown analysis. "It provides the improved performance, smaller form factor, and enhanced features that gamers expect and demand." The manufacturer’s suggested retail price is $399 for the 2TB model, which is $75 more than its bill of materials and manufacturing costs. A lower-priced version, sporting a lower-density hard disc drive (HDD), is also available for $299. Instead of releasing a direct equivalent to the upcoming Sony PlayStation 4 Neo, Microsoft is attempting to regain the market initiative with an improved form factor, including the new UHD Blu-ray drive, small improvements to its processing capability and HDMI interface to enable 4K video support, upscaling of 4K games content and support for HDR. Microsoft will then follow this with its more powerful Project Scorpio console at the end of 2017. Microsoft now has the first mainstream games console on the market that supports both UHD Blu-ray and 4K output for streamed and disc-based video. Plus, the company is shifting all manufacture of Xbox One over to the new Xbox One S model, so it will benefit more rapidly from yield improvements and a reduction in material costs, compared to Sony with its more niche PlayStation 4 Neo offering. The new CPU device in the Xbox One S, supplied by AMD is now fabricated by TSMC (Taiwan Semiconductor Manufacturing Company) using a 16 nanometer (nm) FinFET process, rather than the previous standard of 28nm technology. While this process resulted in a "die shrink" at this early stage it’s typical to have a lower yield rate, which has been built into the estimate of $99 versus the previous device cost of $76. The hard drive in IHS Markit’s previous teardown analysis was 1 TB, which was assessed at $32. The configuration for the new Xbox One S analyzed by IHS Markit included a 2 TB drive, with an estimated cost of $55. In total, Microsoft offers three hard-drive configurations at various prices: in addition to the 2 TB drive in this teardown, there is also a version with a 500 gigabyte (GB) drive selling for $299 and a 1 TB drive version selling for $349. The new console also includes a UHD BD-ROM player, with a bill of materials (BOM) cost of $33.50, versus the previous $18 conventional Blu-Ray drive. In addition to those cost-additive factors in the console components, there were several developments that brought some of that cost back down and offset some of that increase. For example, due to deceased power consumption of the new CPU, a reduction in heatsink and fan cooling requirements was realized, resulting in a smaller and less expensive cooling solution. Incidentally, this also helped reduce the overall size of the product. Decreased power requirements also resulted in a smaller power supply, which not only dropped the cost, but also allowed a smaller module to be installed inside the enclosure. In fact, the Xbox One S no longer requires an external "brick" power supply, for this very reason. The enclosure requirements of the external supply were also eliminated, further reducing costs from $21 to $14. Several other design refinements were also evident, particularly in the mechanical enclosure componentry, resulting in a significantly lower parts count than the previous Xbox One. These refinements, along with the smaller enclosure, cut the total enclosure mechanicals BOM nearly in half -- from $36 to $19. In addition, memory costs have further eroded, even since March of this year, resulting in a $2 cost reduction. Another interesting finding was discovered in the WiFi solution. While this product, as in the previous version, includes three wireless local area network (WLAN) devices – two in the console and one in the controller -- the source for all three has shifted from Marvell Semiconductor to Mediatek. This represents a major design win for Mediatek. i bet around this time next year, sony will also come out with a ps4 slim too. Wait, so they have an upgraded version of XBOne, then they're coming out with an even more powerful one next year? Makes me wonder if the more powerful one coming out next year will have exclusive games. If so, that won't bode well for Microsoft's fans. you can say in a way its an upgraded version for the xbox one s. i think the s in this one stands for slim. it pretty much the same as the original xbox one except that its 40% smaller, and they manage to put the power supply internally instead of externally. beside smaller, its actually a tiny bit more powerful than the original xbox one s. the gpu for the xbox one s runs at 914 mHz instead of 833 mhz that the original xbox one is running. the bandwidth that the ESRAM its running at is 219 Gbytes per second or something like that compare to original xbox one which runs at 204 Gbytes per sec. so that means, some games will either have a slightly better graphic or a bit smoother framerate than the original xbox one. beside, for those that wanted to watch 4K Blu-Ray movies, this xbox one s supports it. games made for the much more powerful one rumored to be coming out next year will be playable on the original xbox one and xbone one s. games made for the xbox scorpio will have a much better graphic and it might run at native 4k resolution which will be downgrade for the original xbox one and xbox one s.